RTR. In TVS talk, that means the epitome of racing performance. What started as Racing Throttle Response has now become a brand by itself. All of TVS' flagship motorcycles come with the RTR tag attached. It is a name with which TVS has been able to clearly draw a line between their run of the mill commuters and their more enthusiast focused motorcycles. And the great part about the RTRs have always been that the difference has never been different in just the branding. They actually are more responsive, more focused, more fun to ride motorcycles. And the RTR 200 is no different. 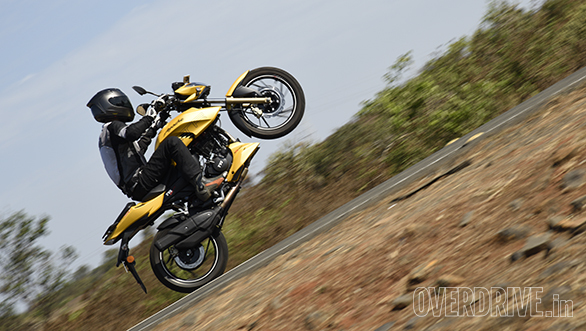 As the new flagship, the RTR 200 brings a lot of firsts for TVS with it. And it all starts with the design. The RTR now looks very distinctive. The design is still a throwback to the previous motorcycles, but TVS has turned the aggression way up with the 200. Head on, it looks like a proper streetfighter thanks to almost 60 per cent of the design from the Draken concept being carried over. The bike no longer uses the bikini fairing that was its mainstay all these years. The seat is now a split unit and entire rear end has been redesigned. The tank still reminds you of the older design, but now has some added muscle to suit the increased aggression. 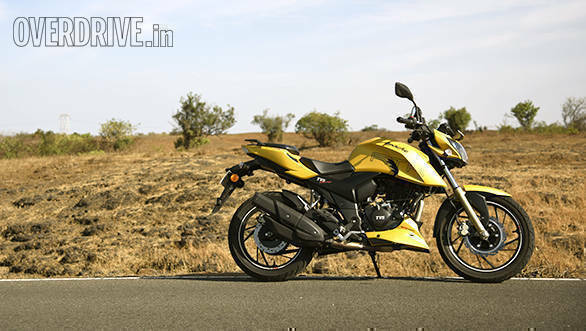 Overall, it is a very good looking motorcycle and in matte yellow, it really turns heads. 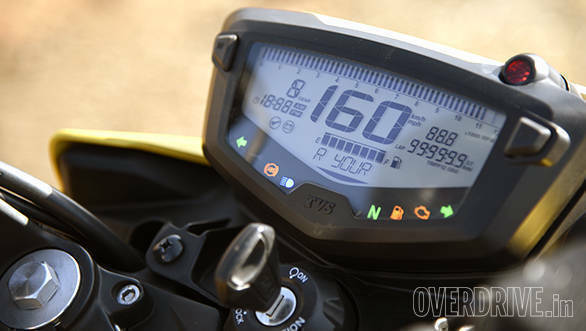 What I really like on the RTR 200 are the clocks. The 200 has one of the most comprehensive instrument clusters I have ever seen. The all-digital cluster tells has a speedometer, tachometer, odometer, two trip meters, fuel gauge, gear position indicator, clock, top speed indicator, acceleration timer and even a lap timer. As with all TVS motorcycles, fit and finish levels are excellent. There are no exposed welds, no glaring panel gaps and all the materials used feel like they will stand the test of time. The Apaches have always been very light, quick steering motorcycles. 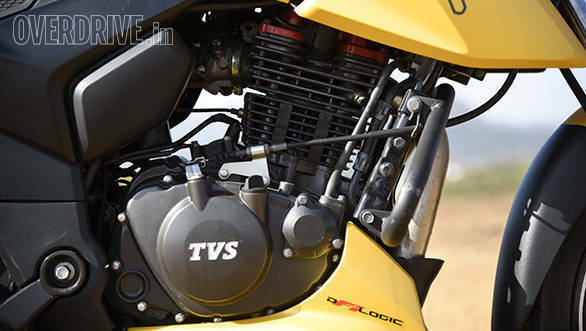 TVS has kept that character alive in the RTR 200 despite the all new chassis. The frame is all new and uses the engine as a stressed member. This is attached to a new, right side up, 37mm Kayaba fork and preload adjustable monoshock at the rear. The wheels are now stiffer alloys with Pirelli rubber and brakes are a 270mm disc up front and a 240mm disc at the rear. All that is well and good, but how do they all work together? TVS had the idea of making a motorcycle that has the ideal balance of agility and stability when they were developing the 200. They have succeeded in this to a large extent. The RTR 200 is quick to change direction and it doesn't take any effort to have it pointed the way you want it to go. But, with quick direction changes it does feel slightly unhappy and you need to get on the throttle real quick to stabilise the bike. This has a lot to do with the soft suspension setup. But hold on, it is only relatively soft and doesn't take away anything from the RTR's handling capabilities. The only thing it does is take a tiny bit of dynamics and trade it in for a whole lot of ride quality. The RTR is super comfortable to ride. It soaks up everything on our roads without complaint. TVS has really done a great job with the suspension setup on the bike. 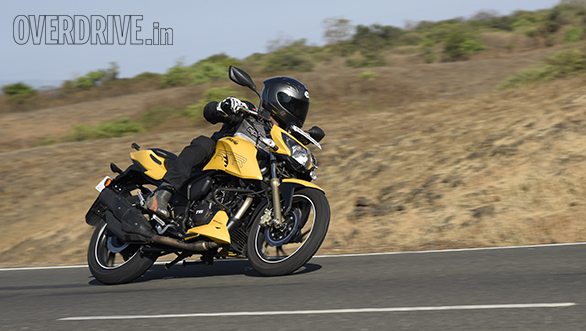 They have created a comfortable motorcycle without compromising on the handling too much  a feat worth applauding. 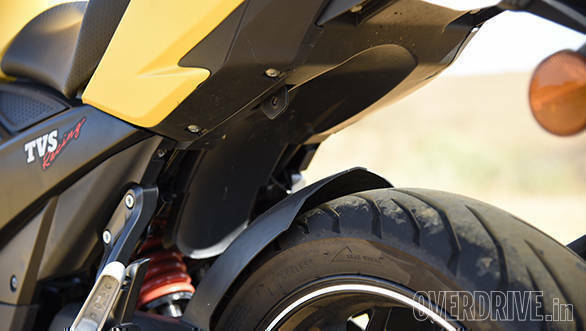 If you remember, when we rode the bike at the racetrack, Shumi had said that there was a slight mismatch between the front and rear tyre grip thanks to the Sport Demon/Angel GT combination that TVS has used. This can be felt under hard cornering when you feel the front slightly at a loss for grip. But does that affect riding it fast on an everyday basis? Not really. The small lack of grip only shows up right at the edge and this is not something that an everyday user will subject the motorcycle to. What we do wish was that TVS had brought out ABS right from the beginning. The brakes aren't bad at all. In fact, they bring the bike to stop from 60kmph in roughly two seconds and 17 metres. But we just cannot stop advocating the importance of ABS in motorcycles regardless of how good and feelsome the brakes are. Specs? Oil-cooled single displacing 197.75cc and using a four valve head that uses a single overhead cam. The motor makes 21PS and 18.1Nm of torque. It isn't class leading, but then that wasn't TVS' target. They wanted to make an engine that would deliver maximum power in city riding conditions while not feeling starved out on the highway. 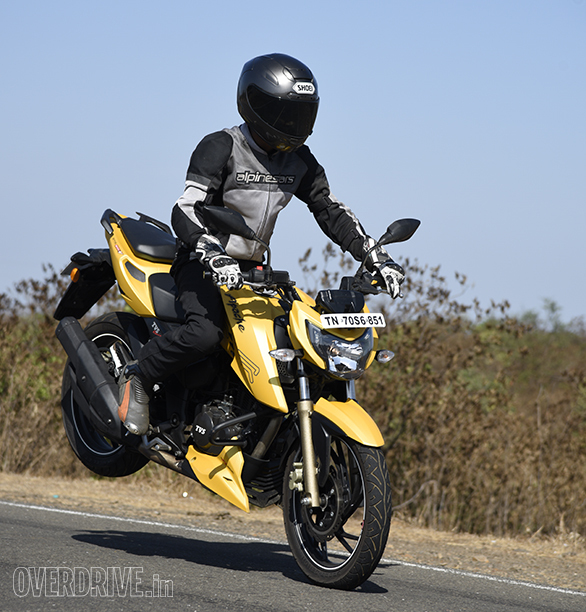 So, in real life, the RTR 200 delivers lots of show in the mid and low ranges. Especially in tight urban situations, there is adequate poke to give you a spurt of acceleration to pull that quick overtake. In gear acceleration is strong through the bottom and mid rev ranges. And thanks to this, the riding experience is a lot calmer. Unlike the 200 Duke, for example, you do not need to keep the engine on the boil continuously. You can stay at comfortable RPMs and then just twist your wrist to get power. That said, don't for once think that this is not a quick motorcycle. It still makes more torque than some of the other motorcycles in the segment. And in fact it can do the 0-100kmph run in 12.25s, which is not bad at all. Only thing is, with the drivetrain design focusing more on acceleration, top speed does take a hit. We could only manage to clock a top speed of 122kmph on the Vbox. Maybe a sixth gear would've given that extra few kmph to add to the RTR's highway ability. There is one area where the RTR shines very brightly though  refinement. We've been going on and on about this since our first ride and for good reason too. 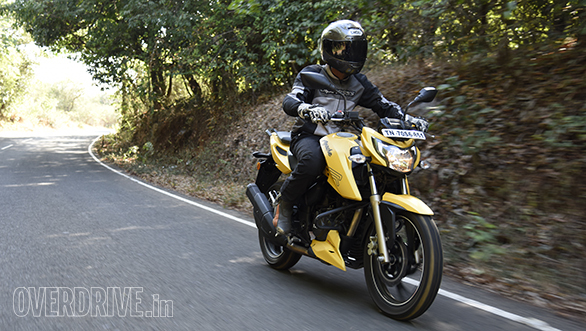 The RTR 200 4v remains super refined at all engine speeds except right at the red line. And even then, it is only a slight buzzing that you feel. And, by sacrificing top end performance TVS also gained another advantage  fuel efficiency. 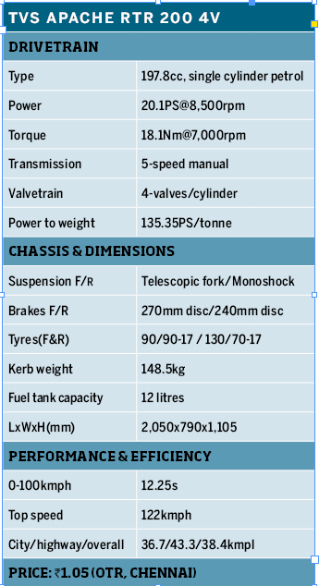 The RTR delivers an overall 38.6 kmpl, which is actually quite impressive. TVS has really built a bulletproof RTR. It performs well, is quite comfortable to ride and is efficient too. Of course you can argue that it doesn't make enough power. But then no amount of horsepower is ever enough. That said, at Rs 1.07 lakh (ex-showroom, Delhi) is not bad price for the bike and puts it just a little above Bajaj's Pulsar AS200. But the crucial question is  would I recommend it? Yes. 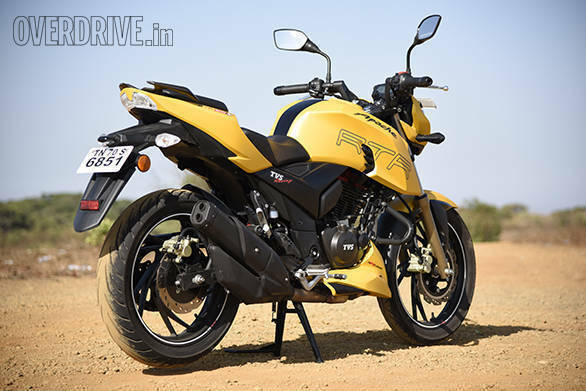 The TVS Apache RTR 200 4v is an excellent motorcycle that does almost everything well. And unlike other motorcycles that do everything well, the Apache also comes with lots of character. And I've always felt that character is what makes such motorcycles desirable.